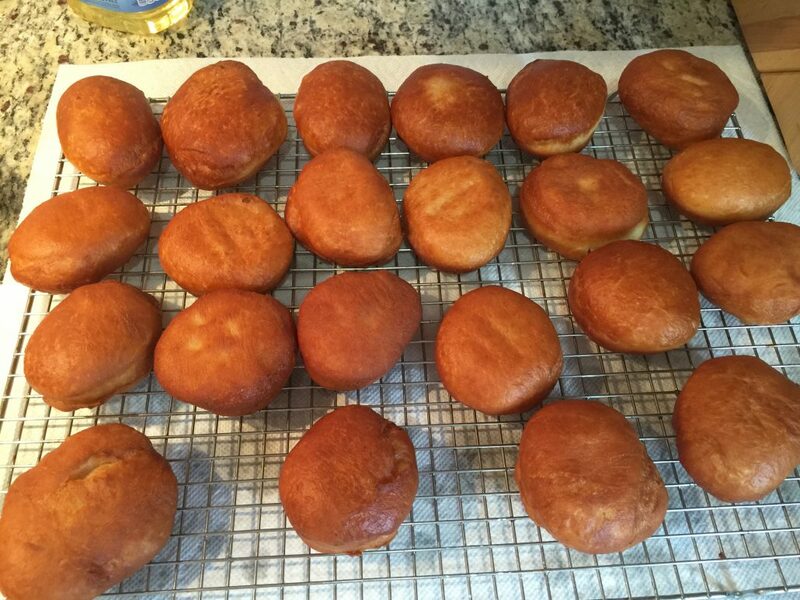 This original German Doughnut Recipe is handed down from generation to generation. No pastry has as many names as the German Doughnuts. 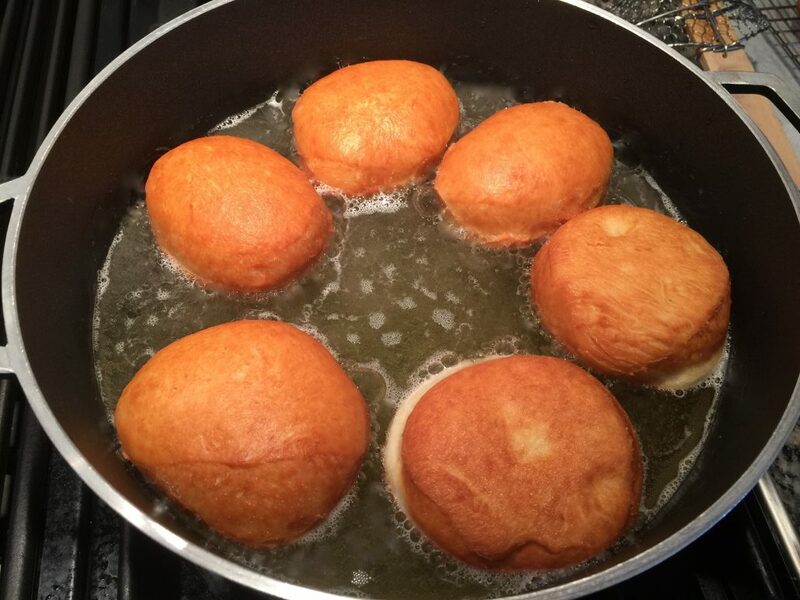 They are also called Fastnachtskrapfen or Fasnachtskuechle or Kreppel or Berliner in Germany. Mix the flour, sugar, salt, grated lemon peel, and dry yeast in a bowl. Make a hole in the middle, place the eggs in the hole and cover with the flour mixture. Warm up the milk in the microwave and pour over the flour mix. Melt the butter in the microwave and add it to the bowl. Both the milk and butter should be lukewarm and not hot. With a handheld mixer mix the ingredients using the kneading hooks. You will know the dough is ready when it comes easily off the sides of the bowl and bubbles are visible. Cover the dough with a kitchen towel and let it rise for about 2 hours or until it has doubled in size. 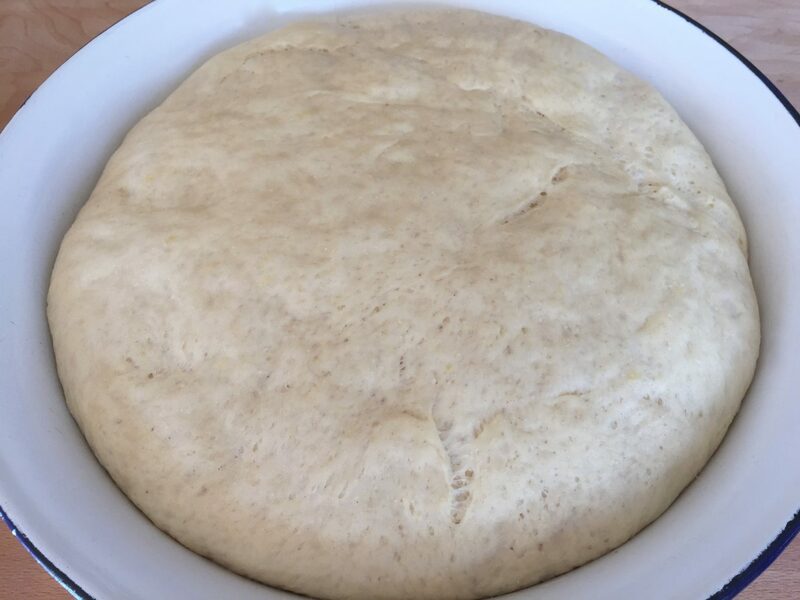 On a surface covered with flour, roll out your dough with a rolling pin about 1.5 cm (just a little over half an inch) thick. In order to differentiate between filled doughnuts and unfilled doughnuts, cut them in two different shapes. 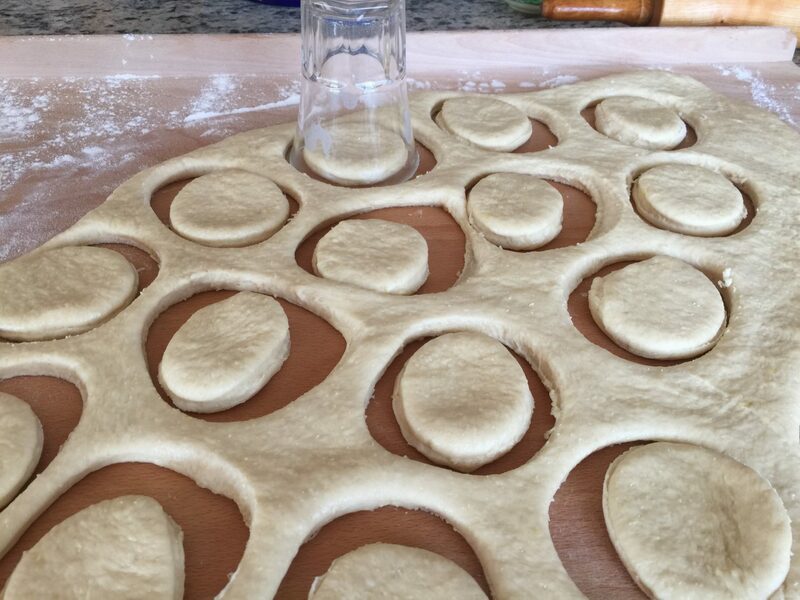 Use a glass to cut circles for the filled doughnuts. 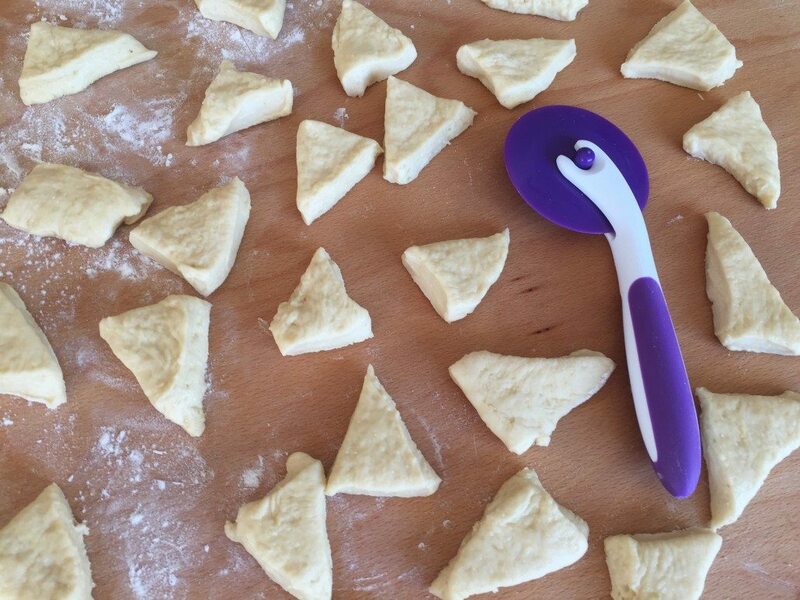 Use a pastry wheel cutter, a pizza cutter, or fondant trimmer to cut triangles for the unfilled doughnuts. 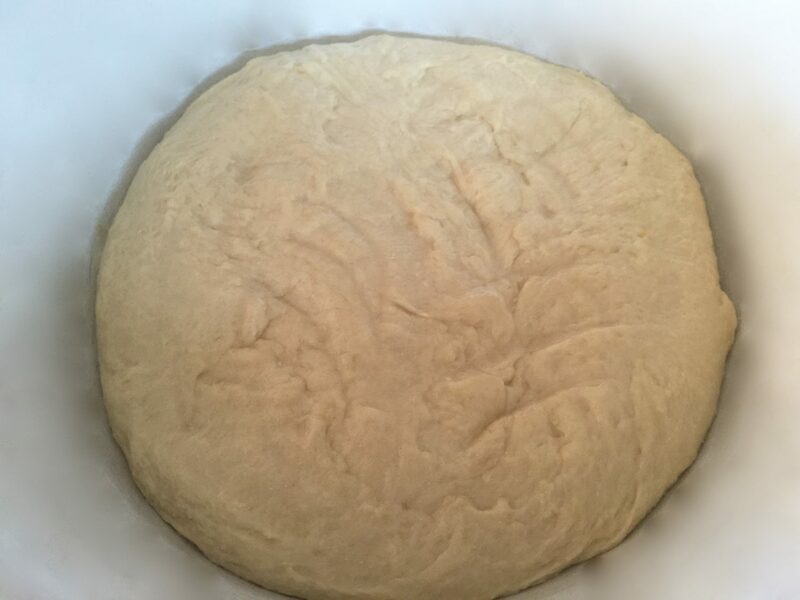 Place the cut dough on a baking sheet, cover with a kitchen towel and let the dough rise again for about an hour or until the size has doubled. In the meantime, prepare your working space on the stove. If you have sufficient space, make sure that you work from left to right. On the left side you should have the unfinished doughnuts. In the middle, place your saucepan filled with oil. 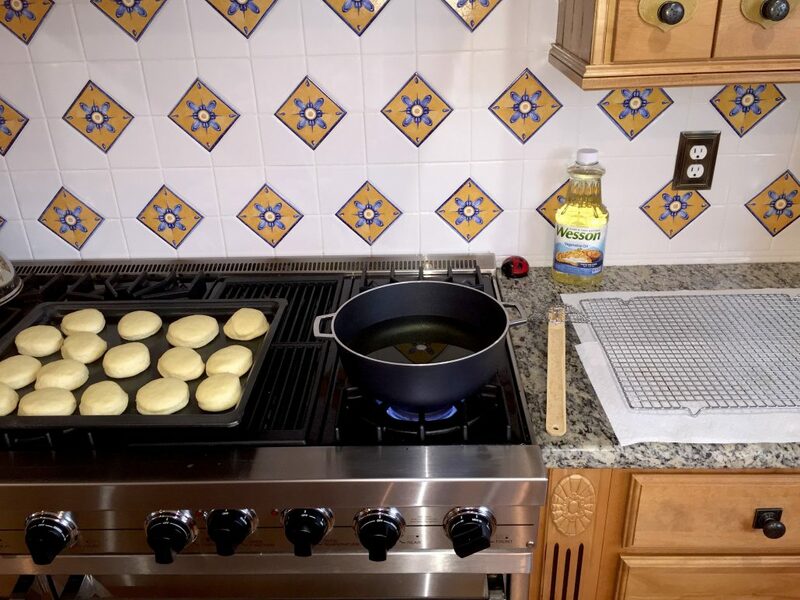 Use a wide saucepan and pour in enough oil that the doughnuts can float to the surface. On the right side, place your cooling rack on kitchen paper towels. Using a rack is helpful because you want any remaining oil to off the doughnuts while they are cooling down. Heat the oil until it is hot enough to fry. Slowly place the doughnuts in the oil, fry them on both sides (on medium heat) until they are golden brown. Use a spider strainer to remove your doughnuts from the saucepan and place them on a cooling rack. Empty the marmalade or jam in a small bowl and whip with a whisk until it is smooth. Place it in a decorating bag and fill the doughnuts using an injector tip or a pastry injector. When the doughnuts are filled, roll them in a bowl of caster sugar or powdered sugar.